Ultra-compact unit is designed to produce vintage tube tones. 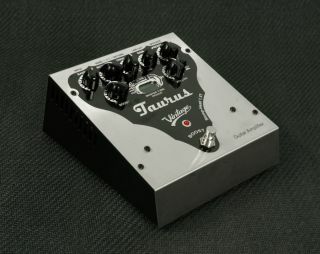 NAMM 2019: Taurus Amplification has announced the Stomp-Head 1.V, a 40-watt ultra-light analog guitar amplifier in a pedal. The 12AX7-driven pedal utilizes Master Tube Design technology to capture the sound of vintage tube amps, and features a three-band EQ (bass, mid, treble), as well as Presence, Gain, Boost and Volume knobs. The Stomp-Head 1.VT is also equipped with a power selector that makes it possible to use the amp in two different power ratings of 40 and 20 watts RMS. The unit is designed to auto adjust itself to different speaker impedance (4, 8 and 16 Ohms). There’s also a line output with speaker cabinet simulation, enabling the Stomp-Head to be used as a guitar preamp, as well as a footswitch-controlled boost. For more information, head over to Taurus Amplification.